Ferret Treasures offers items for sale that consists of a branded line of ferret bedding and jewelry gifts made by our shelter director and fund-raising items purchased or donated to the Ferret Association of Connecticut. All items offered benefit FACT’s mission through the earnings on goods sold or on commissions for a select few of the items offered. 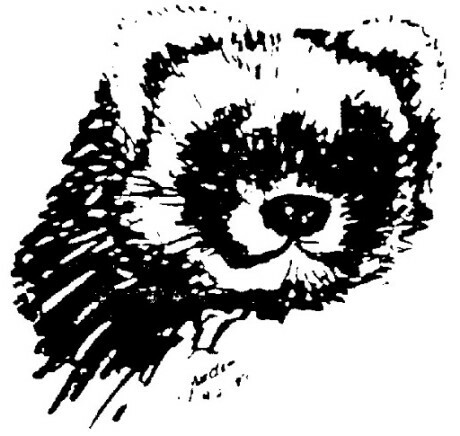 The Ferret Treasures bedding line began even before the start of the in 1991. As ferret owners since the 1980’s, we were discouraged at the poor quality and durability of items available for ferrets. Ferret Treasures initially began as a way to marry our sewing skills with the need to help cover travel costs as we went to ferret shows and learned more about ferrets. When we started the shelter, Ferret Treasures became not only a way to help make sure the ferrets always had great sleep spots, but to help support the space and housing costs for the FACT offices and shelter. Everything we make has been time-tested in the shelter to be ferret-safe, machine washable/dryable and, most importantly, DURABLE. Materials are purchased at discount (bargain hunting is a therapeutic hobby!) so prices can be kept low. Designs have been tested during 25 years of use in the shelter. Quality is excellent. If any item is not up to our exacting standards, we tell you and offer it at a reduced price. Few others can offer ferret owners products made by people who know and have lived with ferrets under “extreme” conditions. Over time, the Ferret Association of Connecticut added a variety of gift items like clothing, gifts and plush to sell as fundraisers. FACT has contracted directly for the manufacture of some items and therefore, we are the exclusive distributor. We continue to seek out unusual treasures like jewelry, figurines, toys, and other gift items for ferret lovers. Many are made especially for FACT and are available nowhere else. Almost everything is either privately manufactured or hand crafted by one of our Board members including jewelry pieces designed by our shelter director. Each necklace, bracelet and bookmark is a OOAK (one-of-a-kind) piece. In addition to the items listed on this site, we offer item sales both via mail, through the shelter newsletter, and in the store attached to the FACT shelter. If you have a special bedding need or request, please contact us by email or phone. Right before Christmas shopping season, we hold a large sale at the shelter store. The store is also open during other open events at the shelter where you can find all the items here along with selected specials, close-outs, one-of-a-kind items and a supply of gently used ferret supplies such as carriers, shampoo, and donated goods. Watch your email, the FACT website, Facebook and Twitter for sales event details. FACT merchandise is also available at selected ferret shows during the year.